So, I just realized I never got around to blogging/reviewing my PopSugar MustHave April box, so here we go! Here’s the first look! Everything is all wrapped up in pink tissue paper and information cards on top. The information cards each give you details about the products: the companies that made them, how to use them, etc. First, we have a custom-made PopSugar Snack Mix made by NatureBox. It’s a mix of nut, dried berries, crunchy sesame sticks and other ingredients, all together in a healthy snack blend. Personally, it’s not as flavorful as I would pick out in my monthly naturebox, but it’s okay. 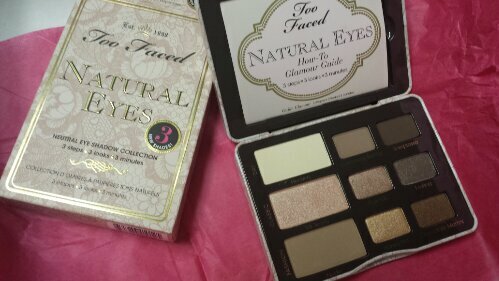 I was most excited for the Too Faced Natural Eyes Palette! This item along covered the cost of the PopSugar MustHave box as it retails for $36. The colors are a beautiful array of tans, beiges, golds and browns to be used daily or to create a smokey eye or nighttime look. Here’s an even closer look at the colors and the cute names to go with each like “Chocolate Martini” and “Honey Pot”. Next, we have Grapic Image Pocket Notebook. It’s a beautiful purple-blue and says “Run The World” on it. I was intrigued to see this in my PopSugar box and just need to remember to keep it in my purse and use it! Next, we have a set of two Fresh Pastry Stand Tea Towels with phrases like “Awesome” written on them. Personally, I wasn’t a huge fan of these as they don’t match my house/kitchen, but they’re a cute idea/concept. My bottle of Caldrea Rosewater Driftwood Hand Soap did spill a bit via transit, but luckily didn’t break like many others apparently did. It’s a nice handsoap for a kitchen or bathroom, but nothing overwhelmingly special. I would have preferred bubble bath/bath bombs/etc. Finally, we have this reusable Blueavocado (Eco) Shopper Tote. It was designed by Lauren Conrad, so I was instantly interested in it, however while everyone is praising the colors and design, I’m not a huge fan of it.. it seems like an ‘older’ paisley-ish print. I’ll still definitely use it though! All in all, I wasn’t super obsessed with this box, but was fairly happy. I basically purchased it due to the Too Faced Eye Palette and Notepad. 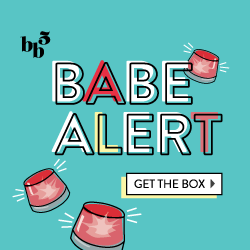 What did you think about this month’s PopSugar MustHave Box? Sign up for your own here, and use code MODNIQUE for $10 off!